In 2014, a user asked us how to do a crisscross pattern for her videos. At the time, not knowing about the NewBlue Video Essentials VI plugins, we had suggested a series of effects using the Boris Graffiti plugin (See "Criss-Cross your Videos with our Plugins"). These effects achieved the intended result, although they were a bit difficult to implement. If you have the Boris Graffiti 6.6 64-bit plugin, you can use these free effects in Studio. 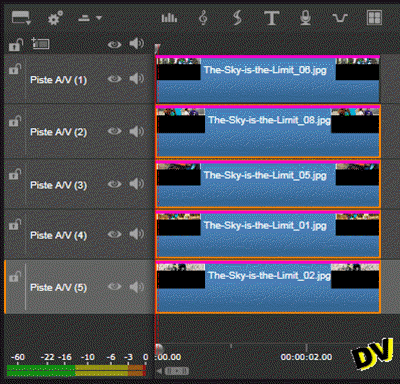 But if you own the Studio Ultimate version which includes the NewBlue Video Essentials VI plugins, you may be able to crisscross your screen using the Picture Grid effect. I say perhaps, because a number of users, including myself, are unable to use the Picture Grid effect without crashing Studio. None of my Windows 7 configurations allows me to use this. Only my Windows 10 configuration allowed me to make this tutorial. So try it and see if you're a lucky one, but if, after applying 2 or 3 effects you get the "NGStudio stopped working" window don't waste any more time, you're one of the unlucky ones. Of course, the problem is with Pinnacle not you. If you are unlucky, you can share your experience directly on the Pinnacle forum. In step 1 of the tutorial "Criss-Cross your Videos with our Plugins," a video gave you a glimpse of what was possible to achieve with this type of effect. 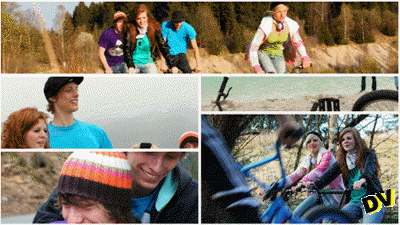 You will get different things but significantly more feasible with the Picture Grid effect. The different results arises from the difference concepts between the Boris Graffiti plugin and the NewBlue Picture Grid effect. With Boris Graffiti, we had a grid that could be filled with media of all different sizes while with NewBlue, we use media resized to fill the screen. In other words, our free Boris Graffiti effects allows crisscrossing the media while the NewBlue Picture Grid effect allows crisscrossing the screen. The Picture Grid effect will allow you to assemble a number of PIP types of different sizes, to fill a screen. To achieve this effect, without borders, you will use 5 tracks in Studio. The Picture Grid effect will allow you to use another type of PIP, of different sizes, to fill a screen. To achieve this effect with white borders, you will also need 5 tracks in Studio. 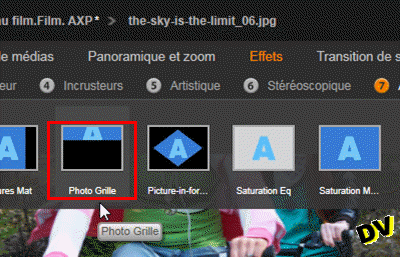 The Picture Grid effect will allow you to make a PIP type for both files located at the top. On the other hand, it does not allow you to make grid lines at the bottom of the screen (1 media file across several grid segments) that you can make with the free Boris Graffiti effects. To achieve this effect with black borders, you will have 4 tracks in Studio (1 empty title on which the Boris Graffiti effect will be applied and 3 media files on which the "2D Editor Advanced" effect will be applied). 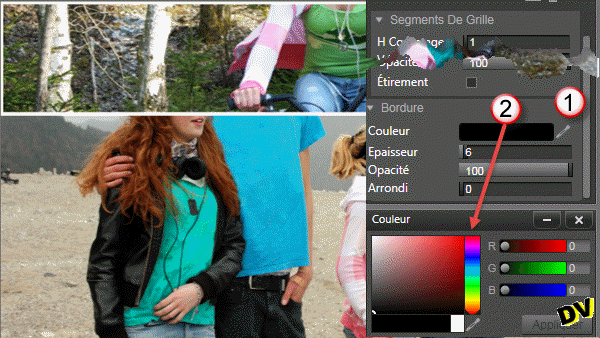 You will also notice that the "2D Editor Advanced" effect used together with Boris Graffiti allows, in many cases, better cropping of the media used. Again, you will have many similarities in the implementation. The time savings will come with the use of a unique effect so you don't need to use additional effects like "Studio PIP" or "2D Editor Advanced" as in the above tutorial. But the general rule is the same, you will have as many tracks and media files as you want to have grid segments on your screen. Continuing with the example of 5 media files and 5 tracks, your timeline might look like this. For convenience I chose pictures but I could have used videos. Once you have loaded 5 tracks, double click on the first track to access the effects editor. The browser on the far left of the window shows you the stack of tracks. The selected track is marked in orange. It is this track to which the effect will be applied. Ever since Studio 17, the Solo option is disabled by default. 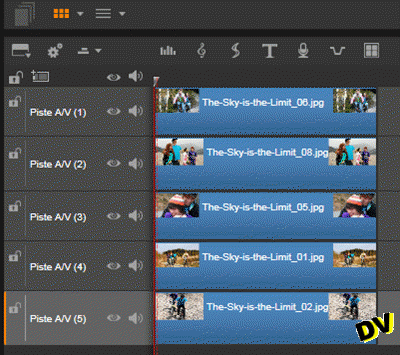 You will definitely need to turn it on (orange) to find your overlapping media file(s). Select the 7- Add-ons item. Click the "NewBlue Video Essentials VI" item. The drop down list of effects will open. Click on the thumbnail for the Picture Grid effect. 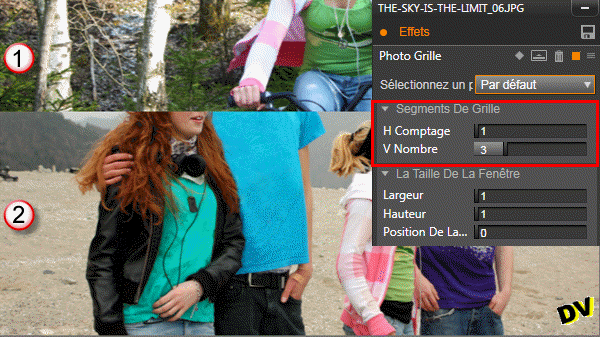 You can use one of the available presets, if it fits your needs for the current image. 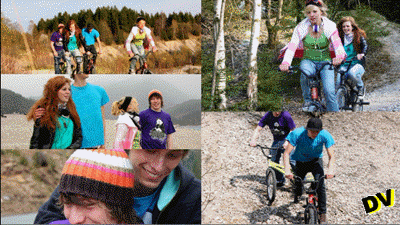 Otherwise, manually set your effect by referring to Step 3 below for the Picture Grid effect. 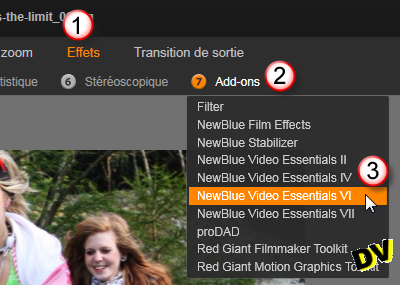 You can find the links for the help files in our new " Documentation of NewBlue FX " for each NewBlue Video Essentials effect. To fully understand the configuration of grid segments, remember that the selected numbers determine the proportions of the crop applied to the image. So with the default setting, the image on A/V Track(1) spans the entire width of the screen (1/1) but takes only one third (1/3) of the vertical part of the screen. As the Solo option is still disabled, part of A/V Track (2) appears underneath. The Width. 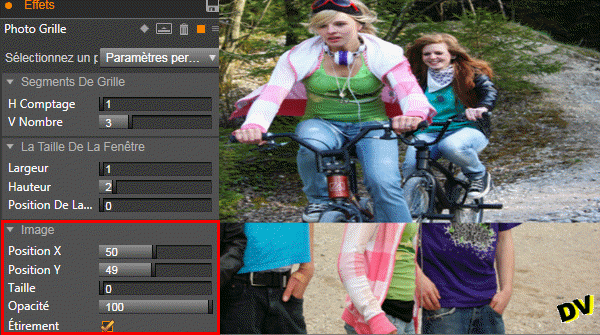 The parameter is at 1 and can not be increased since the image already takes up the entire width of the screen. The Height. In this case, the height can vary from 1 to 3 only. In this case the window size would increase to 3/3 ie; it would occupy the entire screen height. The Grid Position of the window. Depending on the number of grid segments, this parameter optionally moves the window left to right and from top to bottom as it progressively increases. Size. 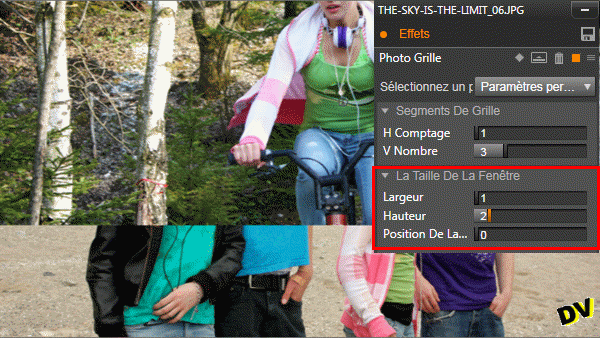 This setting allows you to zoom the image if its size is less than 1/1 in both dimensions. The X and Y positions are effective only if the size is greater than 0. They are used to frame the subject. Stretch. If this box is checked, the entire image is displayed while its size is reduced in at least one of the two dimensions. The image is distorted because the proportions are no longer maintained. either with the color picker. or with the color palette. The media file on A/V Track(1) is framed in white. Corner rounding. The roundness is proportional to the edge thickness. To apply the effect and settings to the remaining tracks, two different methods are available to you. You can decide which method suits you best. If you choose this method, you do not exit the effects editor. After applying the effect on A/V Track(1), do not click the OK button. Select A/V Track(2) in the browser on the far left of the window. Apply the Picture Grid effect on this track and set it. Do the same with the remaining tracks. WARNING : If you click the Cancel button, you do not cancel just the last effect applied ...! To see more clearly, work with the Solo option enabled. (Solo is orange). You can click OK to exit the effects editor and copy the effect you just applied on the A/V Track(1) to the clipboard. Make a multiple selection of the other tracks then right click and paste the contents of the clipboard on each of the following media tracks. All tracks now have the effect and configuration applied to the first track. All that's left is to change the setting of each track by accessing the effects editor. 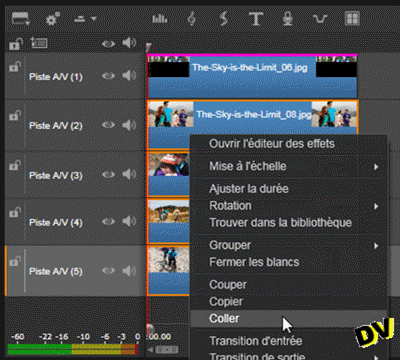 Click on A/V Track(2), to access the effects editor. Change the A/V Track(2) setting. 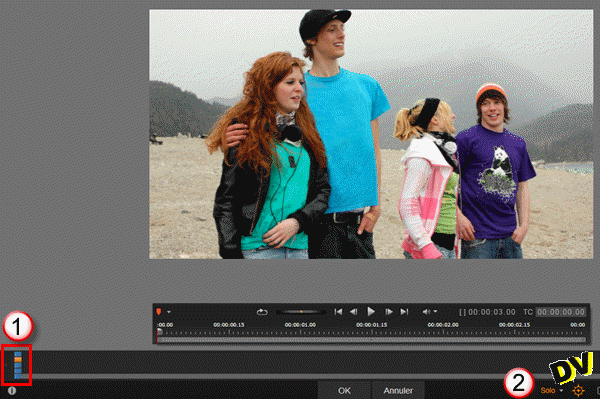 Select A/V Track(3) in the browser on the far left of the window of the effects editor. WARNING : If you click the Cancel button, you do not cancel just the last effect applied ...! So, are up for crisscrossing your media or crisscrossing your screen? And why not combined effects?